Bold gingham checks bring a season-right refresh to this signature accordion style from ZAC Zac Posen. 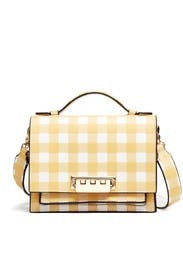 Honey gingham leather structured shoulder bag with fold-over clasp closure. 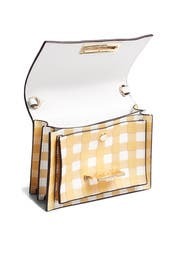 Gusseted, 2-compartment interior with one pocket. Top handles and optional shoulder strap with a 19.75" drop. 6"H x 8.75"W x 3.5"D.